CV (Central Coast & Valley) Decision Makers coverage of the Boulé since 2009 - Sigma Pi Phi Coverage: A classic case study of the agenda setting role of the media, civic journalism and Russwurmian journalism. Sigma Pi Phi Coverage: A classic case study of the agenda setting role of the media, civic journalism and Russwurmian journalism. ___A case study is an in-depth study of an individual unit (e.g., a person, group, or event). _Agenda-Setting Theory states that the news media have a large influence on audiences, in terms of what stories to consider newsworthy and how much prominence and space to give them. The civic journalism movement seeks to treat readers and community members as participants. John Russwurm (1799–1851) was the co-founder, with Samuel Cornish, of the nation's first African-American newspaper, Freedom's Journal (1827). The foundations of Russwurmian journalism, a term coined by INVR Standards / HHEW will be throughout the planned Russwurm Journalism Institute of the HHEW Colleges Project. The historical roots are also found in Freedom Journal's first issue (March 16, 1827) when Cornish and Russwurm argued that, "Too long have others spoken for us, too long has the public been deceived by misrepresentations…." The CV Drum News is one of the most far-reaching news outlets in California, covering the entire Central Valley, from Redding to Bakersfield, and Northern California's Central Coast, from Santa Cruz to Oxnard. Urban cities and rural towns throughout the Central Coast and Valley are home to many of the same prestigious and responsible organizations -- professional and grassroots – facing the same challenges that we find in most major U.S. cities such as LA, Chicago, Atlanta, DC and New York. Specifically regarding the Central Valley, visitors and residents alike will find African-American media outlets, a vibrant religious community, the California Black Chamber of Commerce, the NAACP, the Black United Fund, the Urban League, the Nation of Islam, Jack & Jill, 100 Black Men, the Divine Nine (black fraternities and sororities), BWOPA (Black Women Organized for Political Action), and so forth. All of these and other groups are regularly featured in the CV Drum News. The Central Valley is also home to two chapters (member Boulés) of the oldest and most exclusive Black Greek-letter fraternity in the world, Sigma Pi Phi (the Boule - founded in 1904; Philadelphia, PA). The founder of Sigma Pi Phi fraternity was Dr. Henry M. Minton, a true visionary. Yes, this professional society of college educated and accomplished men is even older than the impressive Alpha Phi Alpha, Inc. The two member Boulés in the Central Valley are; Epsilon Eta (Stockton/Central Valley) chartered in 2009 and Gamma Epsilon (Sacramento) even older, chartered in 1984. In addition to the Boulé and the HHEW Group, other top-tier leadership organizations and individuals will also be featured and followed within this case study corner of this website. This website is designed to help demonstrate to practicing and aspiring journalists how a news outlet can successfully conduct civic journalism and Russwurmian journalism (e.g. covering important groups and news that warrant more positive exposure). Today many people still consider the influential Boulé to be Dr. W.E.B. DuBois's "Talented Tenth," or perhaps more accurately his later "Guiding Hundredth." Within this site you will find positive stories about African-American achievement in Northern California's Central Coast and Valley. We hope you enjoy your stay at this website and within California's Central Valley and Central Coast regions. * Only for purposes of this website are individuals identified as being members of Sigma Pi Phi. They are not identified this way within the actual publication. Archons Tommy Ross and Shelton Duruisseau (both of Gamma Epsilon Boulé - Sacramento, California) share a light moment with Sacramento mayor Kevin Johnson (on right) prior to the start of the 2nd annual Northern California Black Physicians Forum (BPF) on Friday, April 27 at the UC Davis School of Medicine in Sacramento. (But did they resolve the crazy Sacramento Kings NBA basketball saga? :) Mayor Johnson was there to provide opening remarks at the event. The purpose of the Forum was to connect physicians with colleagues throughout Northern California and to discuss physician leadership and potential collaborative roles in chronic disease education, policy change, prevention, and improve health equities in communities of color. The 2012 Forum was hosted in part by Sac Cultural Hub Media Foundation, UC Davis School of Medicine, Sierra Health Foundation, the United States Air Force, American Cancer Society, and a number of other community partners. Archon Bernard J. Tyson (Beta Upsilon Boulé - San Francisco) was the keynote speaker at the California Black Chamber of Commerce's annual Public Policy Luncheon. The luncheon was held at the Sheraton Grand Sacramento Hotel. This forum provides the opportunity for chamber and community members to have open dialogue with state leaders in both the private and public sector. Archon Tyson is President & Chief Operating Officer (COO) of Kaiser Permanente. the nation's largest not-for-profit health plan and health-care provider. He has the direct management of 160,000 Kaiser Permanenete employees and has pledged $1 billion in revenue with small, minority (ALANA - African American, Latino, Asian and Native American businesses), and emerging businesses throughout America. The CBCC, founded in 1995, and headed by Mr. Aubry Stone, is comprised of over 5,000 members, 22 regional African-American chambers, business associations, and faith & community based organizations in the State of California. The 8th Annual HHEW Leaders Conference & Retreat was held in Las Vegas, Nevada, June 22-26 (click here for some photos). Pictured right are three archons who played key roles. From left to right; Archon Keith Orlando Hilton (Epsilon Eta Boulé - Stockton/Central Valley, CA), Archon Kenneth Westfield (Delta Theta Boulé - Las Vegas, Nevada), and Archon Edward M. Willis (Alpha Phi Boulé - Toledo, Ohio). Archon Hilton is the founder and coordinator of this annual conference. Archon Westfield of Las Vegas, a leading laser eye specialist in Nevada, took time out of his very busy schedule to lead a session on humanitarian efforts in Haiti, while Archon Willis, Associate Vice President of Student Affairs at Florida A&M University, co-facilitated a session on "Power Couples" with his Archousa Carla, an assistant vice president of development at The Ohio State University Medical Center. Last year, 2010, Archon Aaron Ford, Delta Theta Boulé - Las Vegas, Nevada) also participated on a panel that focused on African-American issues in Las Vegas and Nevada. Archousa Michelle Alexander, seated below left in black top and looking directly at the camera, is wife of Archon Carter M. Stewart of Lambda Boulé (Columbus, Ohio). Archousa Alexander, a legal scholar and professor, spoke to a full house at the Women’s Civic Improvement Center (WCIC) in Sacramento on pressing issues covered in her book, "The New Jim Crow," regarding unfairness of African-American men throughout the U.S. justice system. Earlier she shared with the CV Drum News that “more dialogues between academics and community advocates need to [also] take place.” President Barack Obama appointed her husband, Archon Carter Stewart, United States Attorney for the Southern District of Ohio. The below photo is of Archousa Alexander with Faye Kennedy of the Black United Fund of Sacramento Valley, as she prepares to sign books at WCIC. Archon Albert E. Dotson, Jr. (Alpha Rho Boulé - Miami, Florida), who serves as the Chairman of the Board of 100 Black Men of America, Inc., is pictured far left with Daniel Bryant, president of the Sacramento Chapter of The 100 Black Men. Archon Dotson, a highly acclaimed Florida attorney, was the keynote speaker at February's Northern California African-American Males Conference in Sacramento. Over 500 youths were in attendance. Remembering Archon Martin Luther King, Jr.
Pictured right is Archon Terrence Roberts (Gamma Zeta Boulé - Pasadena, California), who spoke in January at the University of California, Santa Cruz. Archon Roberts, a psychologist in Southern California, was a member of the historic "Little Rock Nine," the first African-American students ever to attend high school classes in Little Rock, Arkansas, under the federal mandate to desegregate public schools. He was the keynote speaker at UC Santa Cruz's 27th annual Martin Luther King Jr. Memorial Convocation. 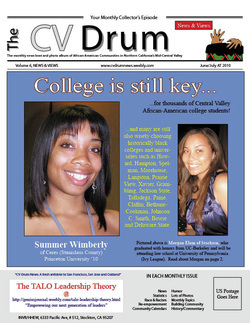 In January 2011 the CV Drum News expanded to the California Central Coast, which covers the region between Santa Cruz in the north to Oxnard in the south. Our very first Central Coast story was of Chicago businessman Stedman Graham as the 2011 MLK speaker in Seaside. Future coverage will focus on positive and hard hitting issues impacting the region, along with features and blogs from individuals and organizations. Archon James Clyburn (Alpha Iota Boulé - Columbia, South Carolina) visited Stockton in October 2010 as the guest of California Congressman Dennis Cardoza (D) and local faith based and community leaders. Archon Clyburn is a member of the U.S. House of Representatives (D-South Carolina) and House Majority Whip. He is pictured left at Stockton luncheon huddling with Epsilon Eta Archon Lester Patrick. The left July 2010 cover features Morgan Elam, daughter of Epsilon Eta's Sire Archon Moses Elam (Stockton/Central Valley, California). Morgan graduated with honors from University of California, Berkeley and now attends law school at the University of Pennsylvania. 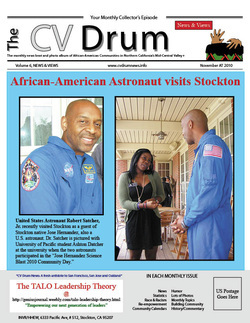 The right November 2010 cover is of Archon Robert "Bobby" Satcher (Nu Boulé - Houston, Texas), who was a guest of Stockton native Jose Hernandez, also a U.S. astronaut. They participated in the October "Jose Hernandez Science Blast 2010 Community Day" event at University of the Pacific. Archon Owen Garrick (Gamma Chi - San Jose, California) journeyed to Stockton and presented at a health forum luncheon at the Marriott Stockton. He is standing between Epsilon Eta archons Keith Orlando Hilton and Johnnie Ford. Archon Garrick, a physician with degrees from Yale, the Wharton School - Penn, and Princeton, explained to the audience that clinical trials are conducted to allow safety and efficacy data to be collected for new drugs or devices. In 2011, he joined the American Medical Association Foundation's Board of Directors as president-elect. If you are a leader (male or female) in search of joining a dynamic keynote speakers directory & bureau, click here. If you want to subscribe or re-new your subscription, let us know.